CYRUS showcases the best of our vineyards and the best of the vintage. Our six hundred acre property was the homestead of valley namesake Cyrus Alexander. When he rode into our valley in 1840 he called it the "brightest and best spot in the world". He chose this spot to build his home and raise his family, and many years later we would do the same. This wine is our tribute to the man, the region and the very best of the vintage. In 1995 Hank Wetzel produced the first vintage of CYRUS and today winemaker Kevin Hall carries on the tradition with the 19th release of CYRUS. He has selected seven distinctive lots of estate Bordeaux grapes for this vintage; three lots of Cabernet Sauvignon with exceptional dark fruit flavors, complex aromas and structured tannins, two lots of Merlot with juicy fruit and floral aromatics, and one lot each of Cabernet Franc, Petit Verdot and Malbec for finesse & depth, inky color, bright acidity and depth. The 2013 growing season was almost identical to 2012. The year began with another dry winter and spring, then throughout the summer we experienced a warm growing season with even temperatures. Our grapes ripened evenly, harvest began earlier than in 2012 and proceeded at a fairly quick pace. While news of the lack of rain dominated conversations, there was an upside to the drought; the grapes had more concentrated flavors than in 2012. Each lot was fermented and aged separately for 12 months, blended to showcase the vintage and aged for an additional 12 months in French oak barrels to meld the flavors. Additional bottle aging resulted in a seamless blend. The 2013 has dark purple color and intense earthy aromas of cassis, black cherry, chocolate, and cherry along with toasty oak and vanilla. This is a silky wine with flavors of cassis, dark chocolate, dark fruits and chocolate covered cherries. 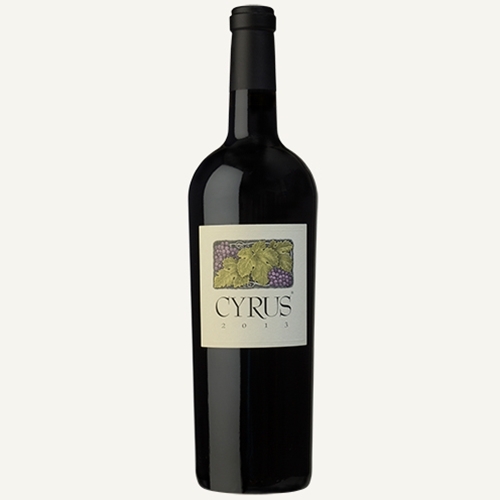 The 2013 CYRUS boasts smooth texture, excellent balance and a long structured finish.